People -- mostly those city folk types -- tend to think that living in the suburbs is dull, pedestrian, and conformist. My friend, the stuff I've already seen around this leafy neighborhood...well, it wouldn't exactly curl your hair, but it could raise some over-groomed eyebrows. Like, the morning I found a pair of red satin pajama bottoms draped over the perfectly trimmed Japanese box hedge. I spent an inordinate amount of time Rear Window-ing it, just waiting to catch someone in the act of retrieval. Sadly, I never did discover which of my neighbors lost their saucy britches, but I certainly look at them all in a brand new light. Another belief about the suburbs I've been thrilled to disprove is that it's all bad food. It's true that after five years of living in a city so stuffed with fabulous food finds as San Francisco, moving to the suburbs might have seemed like committing gastronomic suicide. However, this was something I refused to accept. Of course, I might be doing a lot more cooking at home -- a sure money and waist saver -- but I was still committed to finding good eats in our new neighborhood. For the past year, it has been my fondest desire to find pizza on the Peninsula that made up for the loss of my favorites in the city. Piccino, Pizzetta 211, and Pizzeria Delfina set the curve for me in terms of crust and inventive toppings, and it was going to be really hard to, uh, top them. Even before we walked in to pick up what will be our first of many, many orders to come, I was pretty convinced the people at Howie's Artisan Pizza already knew me. Yeah, hi, I'm the annoying chick who's been bugging you FOR MONTHS about when you're opening? Yeah...sorry about that. Well, as of November 17th Howie's is finally open in Palo Alto's Town and Country Village! Of course, nothing would do except to rush right out and get two sample pizzas -- fresh from the wood brick oven -- in oder to render snap judgements on this long-anticipated place. We tried the Wild Mushrooms pizza (sage, pecorino, mozzarella, and tomato) and the Pancetta and Egg pizza (house made pancetta, eggs, arugula, shaved parmesan, and olio santo). I was especially interested to try the pancetta and egg since one of my all-time favorites at Pizzetta 211 is the pizza that always, always has a Rosie's Farm egg cracked and baked right on top along with seasonal toppings. Possibly due to the understandable confusion and chaos surrounding a grand opening, the egg pie wasn't as advertised on the website menu. No arugula in sight. Instead, we got a pie with cracked egg, caramelized onions, pancetta, some kind of cheese, and red pepper flakes. It was delicious. It's a bit rich to have often, but it was damn good. 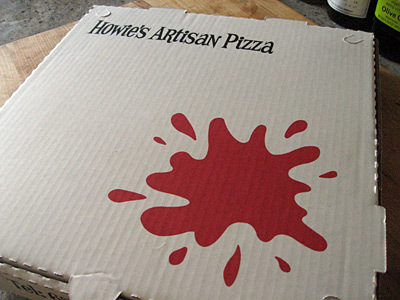 I would still like to see Howie's do an egg pie that lightens itself up a bit with the advertised arugula one of these days, but given the empty pizza box, I'm clearly not complaining. As a consequence of adoring Piccino's stellar white funghi pizza, I was a bit leery of a mushroom pizza that had a red sauce base. Well, I love being proven wrong when it comes to food skepticism, because that pizza was nothing short of awesome. It wasn't too heavy with cheese, which is good because, as a topping, mushrooms can drag down all but the thickest crusts all on their own. The red sauce I was so skeptical of was that kind of red sauce that proves a pizza place is serious about their craft. A pizza place that doesn't understand the importance of a sublime red sauce is as pointless as one that doesn't understand the vital importance of a good crust. Howie's understands both these points. As soon as I saw the browned and bubbled up crust, I was instantly reminded of Kim's Apizza Scholls photos. Judging only with my eyes, I knew this was going to be a good crust. Unless we're talking about Chicago-style deep-dish, which I almost never do since I'm not a big fan of the thick and heavy, pizza crusts should be a silent partner in the pizza making. It should be thin, yet able to stand up to the toppings. Chewy, yet not bready or overly filling. Crispy, but not shard-hard. It's a tall order. Since we weren't eating in, we did what we always do with take-out pizza: slide pieces on our pizza stone in a preheated 500° oven for 1-2 minutes to undo what potential sog set in during the drive home. Perfection. This crust met and exceeded all my expectations and while I hope Howie's get more inventive with seasonal toppings, I can state that we've finally found our local pizza joint on the Peninsula. UPDATE: Before this went to press, we couldn't resist trying two more pizzas. We sampled the Hobbs' pepperoni pizza and added black olives to it. The pepperoni was delicious, but I wish they didn't use canned olives. Their tinny, over-brined flavor tends to overpower everything. 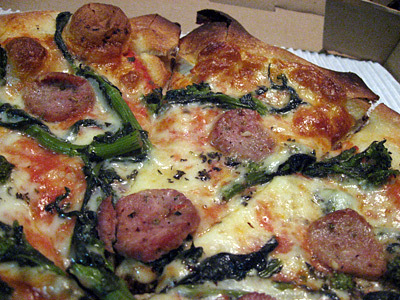 We also tried the sausage pizza with broccoli rabe (pictured above). This was stellar. The house made fennel sausage is from Berkshire pork and was incredible. We're definitely getting that one again.